Sensory deprivation makes it impossible for a person to use one or more of their senses. Sensory deprivation devices can be simple, like blindfolds or hoods, which make it impossible to see. More complicated sensory deprivation devices can cut off a person's sense of smell, touch, taste, thermoception (ability to sense heat), and their sense of gravity. Sensory deprivation can be used in good or bad ways. If a person chooses to go through sensory deprivation for a short time, they may feel relaxed, and it may be easier for them to meditate. However, if a person is forced to go through sensory deprivation, or the deprivation lasts for a long time, it can cause hallucinations, very bad anxiety, strange thoughts, and depression. Some countries in NATO have used sensory deprivation techniques on prisoners because these techniques do not qualify as torture under international laws. Restricted environmental stimulation therapy (REST) uses sensory deprivation to help a person relax and treat problems like pain. The sensory deprivation sessions are short, and the person can choose to stop the session at any time. There are two basic kinds of REST. In Chamber REST, a person lies on a bed in a completely dark, sound-proof room for up to 24 hours. They have food, drink, and a toilet in the room with them. They can choose to leave the room at any time. However, fewer than 10% of people who go through Chamber REST actually leave the room before 24 hours. Flotation REST uses a tank or pool filled with warm water and Epsom salts. The Epsom salts make the water so dense that a person floats in the tank like they do not weigh anything. 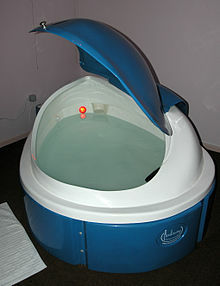 People usually stay in a flotation tank (also called an isolation tank for about an hour. Less than 5% of people leave the flotation tank before the hour has passed. Researchers in the United States and Sweden have found that flotation REST decreases pain and stress. Flotation REST also makes some people feel more creative, helps them solve problems more easily, and lowers their blood pressure. Researchers have studied REST as a treatment for alcoholism, cigarette smoking, and the use of other drugs. The University of Arizona studied the use of chamber REST to treat substance abuse. They treated one group of people with both REST and regular substance abuse treatment. 43% of these people stopped using drugs and were still drug-free after four years. They treated another group with regular substance abuse treatment, but no REST. None of these people were still drug-free after eight months. In 1972, the United Kingdom formally stopped using these techniques to interrogate prisoners. In 1976, the Irish government sued the United Kingdom in the European Commission on Human Rights (Ireland v. United Kingdom, 1976 Y.B. Eur. Conv. on Hum. Rts. 512, 748, 788-94 (European Commission of Human Rights)). Ireland argued that the "five techniques" were torture. The Commission agreed, and said that if the five techniques were used together, they "amount to torture". However, this decision was reversed on appeal. In 1978, the European Court of Human Rights (ECtHR) looked at the United Nations' definition of torture. They decided that the five techniques "did not [cause] suffering of the particular intensity and cruelty implied by the word torture". However, they also said the five techniques were "a practice of inhuman and degrading treatment", which is not allowed under the European Convention on Human Rights, article 3. ↑ Sireteanu, R; Oertel, V; Mohr, H; Linden, D; Singer, W (2008). "Graphical illustration and functional neuroimaging of visual hallucinations during prolonged blindfolding: A comparison to visual imagery". Perception 37 (12): 1805–1821. doi:10.1068/p6034. ↑ 4.0 4.1 Suedfeld, Peter (1999). "Health and therapeutic applications of chamber and flotation restricted environmental stimulation therapy (REST)". The International Journal of the Addictions 14: 861–888. ↑ Kjellgren, A.; Sundequist, U.; et al.. "Effects of flotation-REST on muscle tension pain". Pain Research and Management 6 (4): 181–9. ↑ Baker-Brown, G; Baker-Brown, G (1987). "Restricted environmental stimulation therapy of smoking: A parametric study". Addictive Behaviors 12 (3): 263–267. doi:10.1016/0306-4603(87)90037-2. PMID 3310529. ↑ Coren, Susan; Coren, Stanley (1989). "Perceptual isolation, sensory deprivation, and REST: Moving introductory psychology texts out of 1950s". Canadian Psychology 30 (1): 17–29. doi:10.1037/h0079795.